Manufacturer of alumina balls, demisters etc. 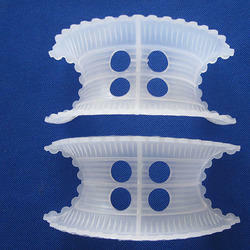 We are engaged in offering our clients with a superior quality range of PVDF Intalox Saddles. KEVIN has a technical agreement with Montz GmBH, Germany for design, manufacture & supply of Montz type structured packing in the Indian market. The Montz Packing is characterized by high separation efficiency, good wettability, high throughput, high flexibility and low pressure drop. The special features of Montz packings include variable geometric dimensions and choice of different surface structures. The Montz-Pak is also available in high capacity designs. B1 250 M & B1 350 M.
Type M structured packing provides significant increase in capacity over the regular structured packing without sacrificing separation efficiency. ME-II Structured packing, is an efficient and economical structured packing used in industry today. ME-II Structured Packing has all the desirable characteristics like predictable throughput, low pressure drop, good efficiency and flexibility; which plays vital role in separations. KEVIN can also provide intermediate sizes to suit a particular case. Raschig rings made from Carbon or Graphite are used in specific applications demanding good corrosion and thermal shock resistance. They are resistant to most acids, alkalis and solvents at temperatures as high as 150°C and also display good erosion and thermal shock resistance. At the same time they have high crushing strength, thus have a long life. plastic super saddles (pss) are the improved version of the original saddles. They are designed to give enhanced internal gas and liquid distribution. The unique scalloped edge is the key to the product's high performance in terms of higher capacity and improved rates of mass transfer when compared to traditional plastic saddles. It also serves to overcome the problem of nesting that is commonly encountered with ordinary saddles. Saddles are also available in ceramic materials. We offer these with a glazed construction to enhance capacity and reduce porosity. Super saddle packings typically find their application in processes requiring high temperature and chemical attack resistance. KEVIN ME-II Wire Mesh Packing has enhanced self-wetting characteristics; as the fiber is woven from fine diameter wires. The packing element consists of parallel-perforated corrugated sheets of wire mesh. These packings are particularly suited in separations that require a large number of separation stages, which typically operate under high vacuum and therefore low liquid loads. The capillary action of the wire mesh ensures complete surface wetting when complemented with high efficiency internals. KEVIN maintains a in-house facility to test various kinds of distributors. Tests are conducted with water (in the absence of any gas flow). For distributors upto 8 meters in diameter and a flow rate upto 750m3 / hr we ensure a flow variation of less than 10% under various conditions. We also provide installation services at plant site. Our service is not limited to equipment designed and supplied by us. Our experienced team is helpful in reducing down time during installation. If installation is by local contractors, then only supervisory services can be availed. Hands on experience in preparing drawings or trial assembly at our works, is an added advantage to our supervision engineers. Our aim is to offer quick and reliable solutions during installation. Alumina Supports have a wide range of surface areas and pore volumes. The supports can be treated for excellent stability at high temperatures to avoid agglomeration/sintering of surface metals. They are appropriate for intermediate pH. Crushing strength range (Kgs): 50 to 1600 . Effective separation of vapor and liquid is a primary requirement for efficient industrial processing. KEVIN Mist Eliminators are engineered to provide high efficiency & low pressure drop for effective separation. KEVIN Liquid-Liquid Coalescers solve separation problems involving immiscible liquids. High performance liquid distributors aim towards ideal liquid distribution, i.e. equal liquid rate per unit area of the packed bed surface. These distributors are available in a complete range to suit various column diameters, liquid rates and service conditions. Models, which can give turndown ratio upto 10:1, are available. Our design team selects the most suitable model for a given application. Bed limiters are safety devices that are available for both random as well structured packing to avoid the expansion of the packed bed, as well as to maintain the bed top surface level. Support plates in addition to providing physical support to the packings, must also allow unrestricted flow of gas and liquid. Gas injection support plates provide separate passageways for liquid and gas, which minimizes the pressure drop across the plate. Support plate model is selected depending upon the packing type and size and the maximum design load to be supported. Collector trays are used to collect liquid from between packed beds. Liquid interception is required in various situations such as total or partial draw-off of liquid, change in the column diameter, which sometimes necessitates the redistribution of the liquid; to cool the liquid in absorbers before passing to the next packed bed etc. Different types of Collector trays are available to suit the column diameter and the vapor and liquid rates. Different Feed devices are available for various feed conditions of the fluid entering the column such as only liquid feed, mixed feed or gaseous feed. Feed devices are selected to complement with the type of Distributor used to give the optimum performance. packing is used in counter-current liquid/liquid contactors to facilitate mass transfer. The heavier phase is introduced from the top which flows downward and exits the column at the bottom. The lighter phase on the other hand enters the bottom and exits the column at the top. Depending on the process one of the phases is the continuous phase and the other is dispersed phase. Special internals are used to introduce the two liquid phases, especially the dispersed phase. Selection & arrangesment of the internals depends on which phase (light or heavy) is continuous and which is dispersed. In all cases use of feed pipes for directing the feed, light and heavy, to the disperser are recommended to control velocity. KEVIN is also in a position to offer tower internals i.e. bed limiters, distributors, support plates, etc. in a variety of polymer materials including FRP, polypropylene, CPVC and PVDF. These internals are designed to provide optimum performance and operating conditions. Major advantages of plastic internals are their lightweight construction and chemical resistance in turn leading to extended life of internals. KEVIN also engineers ( hydraulic & mechanical design) of all major internals for packed tower like packing support, bed limiters, various types of distributors & collector trays, liquid and vapor feed inlet devices etc. These internals can be supplied up-to a column diameter of 7000 mm. Also offered are services for reviewing the column drawings and attachments typical for non-metallic internals. Medal-Pak ( formerly sold as IMTP® ) gives the best of both worlds in terms of performance (i.e. low-pressure drop and high efficiency). It can be effectively used in both high pressure and vacuum towers. Other advantages include large effective interfacial area, high mechanical strength, and low cost. Its monolithic construction overcomes the problem of "opening out " at the ends as can be experienced with ring-shaped packings. Medal-Pak is available in an array of sizes to provide multiple combinations of efficiency and pressure drop. Medal-Pak can be fabricated from a variety of metals including, but not limited to, Carbon steel, Stainless steel, Copper, Aluminum, Titanium and Zirconium. It also increases the interfacial area available for gas-liquid contact. It’s unique design incorporates strength reinforcing ribs that allow for lower thickness and taller beds, thus reducing procurement costs when compared to traditional Pall Rings. Omni-Pak (formerly sold as Snowflake® ) is a high-performance plastic packing. It offers superior efficiency and capacity in environmental application such as scrubbing and stripping. Its distinctive shape lowers the pressure drop, which significantly reduces energy consumption. Its various applications include fume scrubbing, acid gas absorption, VOC stripping, wastewater treatment, flue gas scrubbing, etc. It gives higher efficiency compared to Pall Rings 38 mm (1.5 inches) and larger as well as #2 Plastic Super Saddles and larger. To complete the range of mass transfer equipments, we offer all types of trays most widely used in the industry i.e. Valve, Sieve, Bubble-cap & Baffle Trays. We have supplied all types with single as well as multi-pass downcomers and in both Segmental and Cartridge construction. Valve trays give the advantage of higher efficiency and capacity over Bubble-cap trays and higher turndown ratio compared to Sieve trays. Various types of valves are available to take care of different conditions like high capacity, high turndown ratios, fouling service, very low liquid or very high gas rates etc. Sieve trays are flat perforated trays which give the advantage of low maintenance cost and low fouling tendency. Bubble Cap Trays are also flat and perforated but have fixed risers over the holes and multi design caps in the form of inverted cups over the risers. We carry out complete feasibility study for new and revamp projects. The range of service includes process simulation, hydraulic design of columns, and preparation of preliminary G.A. drawing of columns, be it design or drafting of absorber, stripper, fractionator or extractor. Our vast experience in varied industries and access to libraries, coupled with our own archives of past jobs, has helped us to create a strong database in various mass transfer applications. Our experienced technical staff is available at a click for your needs. You can rely on us for almost any SOS guidance in design, engineering, drawing, supply or site related problems. High manufacturing capacity of components like Random Packing, Valves, etc. can take care of your typical emergency replenishment requirements during unplanned shutdowns.